Hope you all have had a terrific week! The grandkids got home from Pennsylvania so I got to play with them for a few days. So much fun! I’ll be doing some blog posts about the things we did soon. Now I’m off to Iowa to help my folks out for a couple of months. My mom is having surgery next week, so please pray for a speedy recovery! Every year when my kids were growing up, I declared the time period between Thanksgiving and Christmas “ART MONTH”! We cut our formal lessons to the bare minimum and concentrated on making presents. A major activity was making cookies and treats for everyone we knew. I would buy tins at garage sales throughout the year and during “ART MONTH” we would fill them with mouth-watering treats. Are you celebrating “ART MONTH”? This is geared towards groups, but my kids would have loved doing this right at home. What about your kids? You could use this for review with any book or lesson! Do you know all of your neighbors? Have a baking day with your kids and then take goodies to them! Get some party noisemakers and reenact the story of Jericho! If you don’t have any, you can use this link to order some and you can help me out at the same time! I get a small commission. Your child may exhibit these signs when he/she is preschool age, but if he/she doesn’t, don’t worry! The average age for a child to be physically and mentally ready to read is 4 -12. Don’t push it! Have your kids write a paragraph about how they would want to be decorated if they were a Christmas tree. Make paper ornaments with vocab words written on the backs. Put them on the tree. Then have your kids pick one or two each day and look up what it means. Ask your kids what they would do if Santa were stuck in a chimney. Have them draw pictures and write a story. Name your elves. Then talk about what kinds of characteristics they have. Are they shy? athletic? What kinds of things are they interested in? Woodworking? electronics? Then write a story about a day in their lives. If you don’t have any elves, you can buy some through this link and it will help support this page! Make a crossword puzzle from words in a Christmas song and let your kids guess which song the puzzle is about. Then challenge them to make one for you! Make a Christmas tree from construction paper or felt. Then make several cards with numbers on them on different colored construction paper. Place these in a bowl. Have your little one draw out one and decorate the tree by putting that number of sequins, beads or pom-poms of that color on the tree. Older kids can pull two and add them together. Can’t say enough good about this game! It was a favorite at my house for years! If you don’t have it in your house, please consider buying it through this link and help support this page! Is there a National Guard or a military base near you? Call to see if you can get a tour! Great field trip! Find out about how it came to being and where those stationed at that base have served. Have your child pick his/her favorite piece of art you have in your home. It can be a painting, a craft, a figurine, quilt, or whatever they love. Then have him/her describe the piece. What is the medium? What do you like about the lines, colors, textures, etc.? Where is it in your home? What makes that place a good place to display it? And anything else they can think of to describe it. This could make a great dinner time discussion or a blog post for older kids! Something fun to do with all those broken crayons! Ask Jeanne: Do Homeschoolers Get a Diploma? De-boning chicken today! A while back I ran across a deal! $0.34/lb for chicken leg quarters! Can’t beat that. Anyway, I’m needing room in the freezer, so I’m putting 20 lbs of frozen chicken in the roaster at night at 200 degrees. In the morning, I turn it up for a little while just to get them good and done. Then I de-bone them and put them in the freezer again along with their broth. There’s a real life math problem here for you! Which is the better buy boneless chicken breasts or chicken leg quarters if you look solely at meat yield? I looked it up and found that leg quarters have an approximately 62% meat yield as compared to boneless, skinless chicken breasts. To figure out what the price of the actual meat is, divide the price by 0.62. $0.34/0.62=$0.548/lb. Chicken breasts were on sale that day for $1.99/lb. The breasts usually cost $2.99/lb. Yep, I got a great deal! What is the last bargian you came across? Click on the link for a free worksheet! Challenge your kids to find as many 8s as they can! Click on the link for your free copy! Over the summer, I’ve only been unschooling myself because my son moved to Keokuk and I haven’t had any kids. This week his wife went back to school and Grama gets to babysit and teach! So what does an almost unschooling day look like for The Brown One and me? He’s only 3 1/2, so it looks pretty much like any stay at home preschooler’s day. We have a check off list so I keep on track that includes sorting, letter and number ID, shapes, phonics, counting and writing, but these things can look different from day to day and even from hour to hour. For instance, this morning we read a book about trains. We counted the number of cars and animals and we looked for the numeral we had counted on that page. We looked for the letter t. We talked about how the letter t sounds like “t” in train and tried to think of other words that started with the letter t.
Then The Brown One asked if we could play domino math. Domino math is a game I made up that can be quite complicated for older kids, but our objective right now is counting and matching. We put the dominoes down face down and take turns drawing them out. After we draw, we count each side and then look to see if we can match them to a domino that is already on the table. The dots on the dominoes I have are colored. That makes it easier to match, but tricky too since 4s and 11s are both brown, just different shades 😉 There is no “winner” at this age. We just play until he gets bored with it and then of course we have to set as many as we can up on their edges until they all fall down! We took break from “doing school”, had a snack, did dishes and watched “Team Umizoomi” Then The Brown One wanted to “do school” again so I helped him with some dot-to-dots I had printed off the internet. Then he wanted to paint so I set him up with that while I cooked lunch. After lunch we went for a long walk outside for PE. He would run with the dog, while I pushed his little sister in the stroller. Then he’d sit on the stroller for all of 30 seconds to “rest” and then off to run with the dog again. When we got back we worked outside until quiet time. I think I wore the little guy out! If he wakes up, there’s some other activities we might get too, but if we don’t it’s OK. There’s always tomorrow! This is one of The Brown One’s favorite books. It’s called WORDS: My First Words Book by Playmore Inc. I picked it up at a thrift store for a buck sometime back. The Brown One is still a little too busy most of the time to sit still and listen to a whole book being read to him, but with this book it doesn’t matter. We flip from page to page as he pleases and “read” the words. I put my finger on the word he want’s to read and sound it out slowly before putting the whole word together. I talk about the different letters and the sounds they make and if there is a letter combination in the word that makes a different sound like “ch” or “er” I point that out too. At first, he paid no attention to me, but now he is starting to repeat what I say. We identify colors; discuss living and non living things, where food comes from; explore celebrations; consider dressing for the weather; and count things in this book! 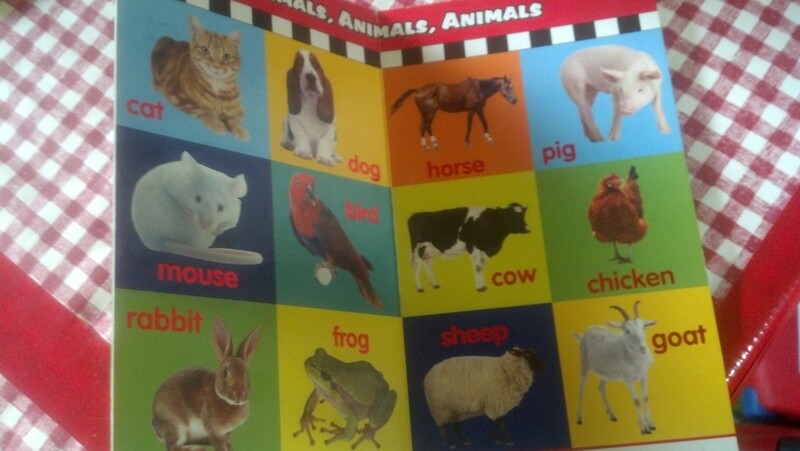 Just from this one little toddler board book we’re covering language arts, art, science, social studies, health and math! You can do this too. Take any activity that your child enjoys and find creative ways to cover 2 or more subjects. Yes, it’s true. I let my kids play with money. This is one of the more expensive activities I do with my kids. I throw a bunch of change in a cardboard flat and let them play. We count, we identify coins, we sort them, we build castles and towers for fine motor development, we make up games and pretend the money monsters are going to eat us 😉 Pretty much anything goes. The only rules we have are: The coins can’t go near your mouth, and no throwing … well, that one gets broken now and then when we do a coin toss. That involves 4 bowls on the floor (one for each type of coin). We try to get the nickles in the nickle bowl, the dimes in the dime bowl, etc. Another variation is to mark the bowls with price and try to get the right combination of coins into the bowl to come up with that price. No need for boring worksheets! Make learning fun!